At 5am on the 10th of September, I opened my eyes and opened my laptop in order to get my first look at the long-anticipated iWatch that I hoped to add to my Apple collection. I haven’t always been an Apple fangirl – my first smartphones were Androids (2 Sony Ericssons and a Samsung for personal use and first an HTC phone then a Samsung Galaxy S3 for work). My computers had always been PCs other than a PowerMac G4 I bought once for $50 thinking it would be a cheap way to learn the Apple interface. My only Apple device was an iPod Touch. I also had an Android tablet but found it slow to start up and shut down and the wireless adaptor was barely satisfactory. My personal Samsung was becoming more and more frustrating in that it needed recharging more than once a day so when the opportunity came to order the brand new Apple iPhone 5S and collect it on a trip to the US, I couldn’t resist. Having made the decision to get an iPhone I also decided to purchase a 3G iPad before I left. I bought the iPad from Noel Leeming and a few days later, arrived in Reno, Nevada where my iPhone was waiting for me. Both were business devices and I was able to claim back the GST. A few months after I returned to NZ my high-specced Sony Vaio laptop was was protesting greatly about how hard it was having to work. It was blue screening far too frequently so I started investigating what I would replace it with. I refused to buy a Windows 8 PC but the Windows 7 models available offered nothing more than the Vaio that was slowly giving up the ghost. Having used Macs a little at work I decided to investigate buying a Mac instead. I originally wanted a laptop but it turned out that I could get way more computer for my buck if I bought a desktop computer, and I was confident that I could use my iPad with bluetooth keyboard as a portable device. So I leased a shiny new 27-inch iMac and set it up in my new home office. I’ve never looked back. I’ve since added refurbished MacBook to the Apple family – it’s a 2010 model but runs Mavericks so in terms of software is identical to my iMac. It’s significantly faster than my Vaio too. An Apple iWatch or something else? Being an Apple owner I have held the iWatch in high esteem but there was no indication from Apple how long we would be waiting for it. So I looked at alternatives from time to time. An obvious choice was the Pebble and while the eInk screen has definite advantages (like being able to tell the time in bright sunlight) I didn’t love it enough to rush out and order one. The Samsung Gear was the next one to be launched but is an Android device so wasn’t an option. Then I discovered the Doozy on the Kickstarter website. It was perfect – it worked with either Android or Apple and was a classy-looking device. It was an analog watch with a few different watch face and band options, and displayed different coloured lights on the screen when your cellphone received a text or phone call. I really liked it and went ahead and placed my Kickstarter bid which entitled me to one of the first Doozy watches to be made. Within days however, the Kickstarter campaign had been cancelled. 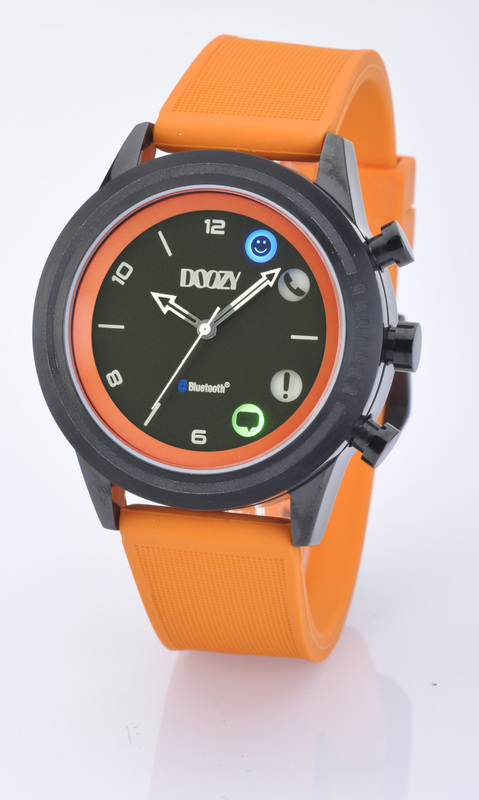 A company had purchased all rights to the Doozy watch, including the patent, so the campaign couldn’t continue. It has been almost 12 months and still there is no word on what came of Doozy. So I decided that I’d wait to see what Apple had to offer. It was known as the iWatch for so long that I was disappointed to see it launched as the Apple Watch. Why no ‘i’? iPod, iPhone, iPad, iMac – but not an iWatch? The watch ‘was’ launched at the September Apple Live Event but with a day of 2015 for availability. There has since been another Apple Event but no further update on the availability of the watch. The longer it takes, the more chance there is of another company coming up with a smart watch that will tick all of my boxes. So a delay isn’t necessarily a bad thing. The Apple Watch is going to cost at least NZ$450 which isn’t cheap so there is still a chance that Doozy, Pebble or some other brand name smart watch could end up on my wrist. Also, the longer it takes for the Apple Watch to be available or an alternative brand to say “pick me” the more chance there is that I’ll realise that I don’t actually need one. ← Does our website still meet our organisational needs?